Have you ever wondered who you would have been if your life had gone differently? How would you direct your life if everything were up to you? Maybe you would be a magician, or travel around the world? Or maybe big business tempts you, and your goal would be to earn a million dollars? 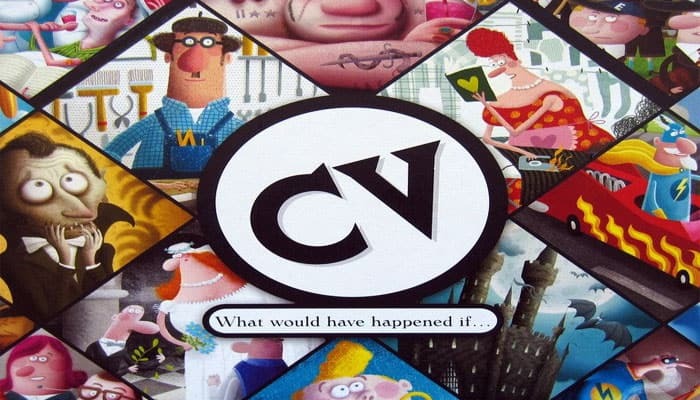 "CV" means curriculum vitae - your resume - and in the dice and card game CV you will lead a character through his entire life, making many choices about friends, relations, jobs and activities. Everything is possible: a dream job, new relationships and skills. You can be whoever you want! The goal of the game is to write a CV of a fictional character, whom the player represents. Players roll the dice and use the symbols thrown to gain cards representing different accomplishments in life. 5, 30. Life Insurance - Play this card to avoid losing a card from misfortune. 11. Zoo trip - Play this card to throw 2 more dice during a turn. The card can be played during any of the 3 dice rolls in a turn, and its effect lasts for the rest of that turn. 12. Bicycle - The player who starts with this card reveals it face up and is the starting player. It is that player's first possession.